In part 1 of this post, I detailed where my web pages rank on Google for keyword phrases related to my books and online identity: "music marketing" and "music promotion." Now I'll share a few simple tips you can use to rank better on search engines for your own keywords. So you play "easy listening" music. Fine. But ask yourself, "Is there an even more specific way to describe what I play?" Easy listening music can be further defined as lounge, cabaret, love songs, mood music, soft rock, and more. What words best clarify your type of easy listening? And more importantly, what words might fans of your music search for online? Be sure to include your chosen keywords in the Title tags of your pages' HTML code -- especially your home page -- with the most potent words first. Example: "Soft rock love songs from The Smooth Tones." For my purposes, I called my blog "Bob Baker's Indie Music Promotion Blog," which appears in the Title tags of every page. Google loves it when pages specifically reference what they're about. The easy listening band might register SmoothTonesLoveSongs.com or SoftRockLoveSongs.com. 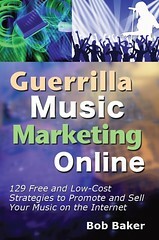 I grabbed MusicPromotionBlog.com to reinforce what my blog was about. Again, search engines like to send people to sites that clearly communicate a specific topic, and a well-chosen domain name will help. If you already have a domain name (such as SmoothTonesMusic.com), add a subdirectory and send people to SmoothTonesMusic.com/lovesongs/. While I own MusicPromotionBlog.com, my blog is actually hosted on my main site at bob-baker.com/musicpromotionblog. Therefore, my blog name, subdirectory name, and Title tags all reinforce the keywords I want to emphasize. To show up on Google, you must have incoming links from web sites that are already indexed by Google. The more the merrier, and the higher profile the site, the more weight its link to you will carry. In the old days of the Internet, you got incoming links by trying to get other sites to link to yours. You can still do that, but these days there are tons of options to create dozens of your own incoming links. Examples: Include active links to your site (or your specific subdirectory) from your profile pages on MySpace, Flickr, YouTube, Blogger, Amazon, and tagging sites like Del.icio.us and Technorati. Links from these popular sites carry weight with Google. Whenever possible, use your exact keywords as the active link text. Don't just write, visit our "home page" for more info. Better: Check out samples of our "soft rock love songs here." Use these five simple tips to improve your Google search engine rankings, whether you play "music for the glass armonica" or "Irish drinking songs for cat lovers."